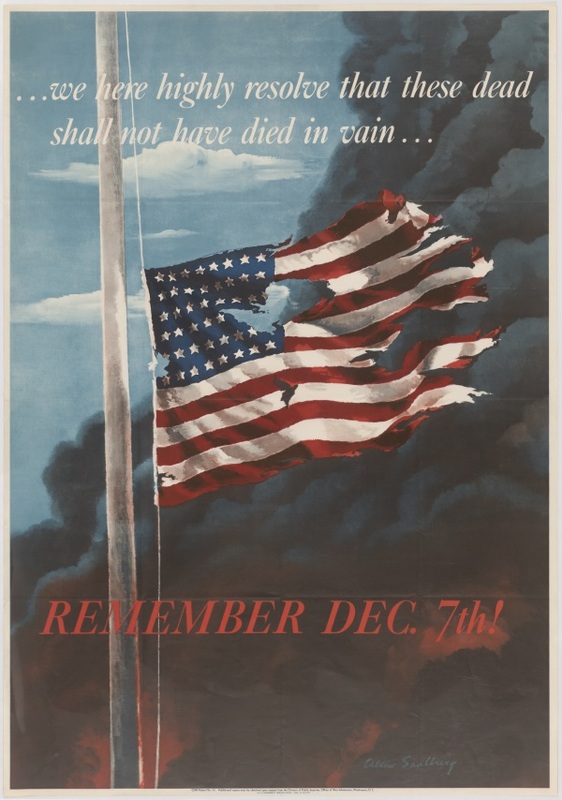 From September 1939 - December 1941, the United States was not officially at war with any of the Axis powers. While support was given to the Allies through programs such as Lend-Lease, there was a strong isolationist sentiment following World War I and the failed League of Nations. This stance changed just before 8 a.m. on December 7, 1941. Hundreds of Japanese fighter planes attacked Pearl Harbor, an American naval base near Honolulu, Hawaii. The fleet was devastated, losing almost 200 airplanes and nearly 20 vessels, including wight battleships. Over 2,000 American soldiers and sailors lost their lives, including over 1,000 men from the USS Arizona, who sank with the ship. President Franklin D. Roosevelt addressed the nation soon after the attack, and described it as, "A date which will live in infamy." Congress swiftly approved his declaraion of war against Japan. Three days later, Germany and Italy declared war of the United States. 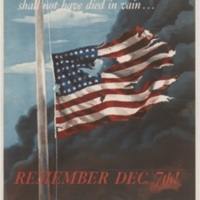 Pearl Harbor became a rallying point for the war effort, similar to "Remember the Maine" from the Spanish American War. Analyze: The quote on this poster comes not from FDR's rousing speech, but from Lincoln's Gettysburg Address. Why do you think think the creators of this poster would have selected this quote? Art Exploration: Design another version of this poster using text from FDR's speech instead. Social Media Spin: Create a tweet, with hashtag, that you would use with this image if reporting the event today. “Remember Dec. 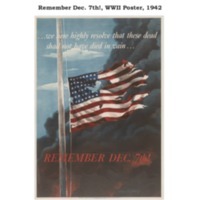 7th!, WWII Poster, 1942,” Document Bank of Virginia, accessed April 21, 2019, http://edu.lva.virginia.gov/dbva/items/show/82.